Several ex-teammates, coaches and managers (including: Nic Groom, Don Armand, Kyle Brown, Marcel Brache, Dillyn Leyds, Scarra Ntubeni, David Wessels and many more…) pay tribute to Wes in a special video, compiled to celebrate his 100 cap milestone. Here we catch up with Wes as he reflects on 100 games as an Ikey and celebrates his appointment as new Head Coach of the U20A side for 2019. 1. What does it mean to you to earn your 100th cap for the Ikeys? For me it was a huge achievement, the club means a lot to me. I have so many friends at the club who are there currently and who have moved on. In the build-up I realised the achievement and the guys I am joining on 100 caps, so it was really special. 2. What moment(s) would you pinpoint as your highlights during your time playing for UCT? Definitely going unbeaten with the 2007 u20A1 Trojan team and winning the league; winning the Varsity Cup in 2011 and then also winning the league in 2011. There are so many moments. I mean the endless fines meetings, the great victories, and so much more – it is a tough question. 3. Why do you play rugby? What impact has the game had on your life? I play for the camaraderie, there is nothing more special than playing rugby with your mates – and I mean genuine mates. I was fortunate as I was able to play with my childhood friend, Marcel Brache and there are memories we will cherish forever. 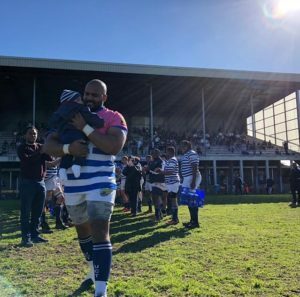 I met my wife through UCT Rugby Club and it was an emotional time to see my daughter being able to watch her Dad play rugby for this great club. So, as you can see the impact on my life is immense and I am sure it will continue to be. 4. You seem like quite a jovial person. Did you have to become more serious as the team’s Captain or was it a case of inspiring the guys with a sense of humour? I would like to think that I lead by example. There is no doubt that I love a joke or two, ask Dylan Sage! But the role for me has never changed, I like to lead by the performances I deliver on the park. Trust me, the jokes dry up quickly when you are going to run out to a packed Florida Park. It’s at those times that, as a leader, you have to try and stand up. I am fortunate as at UCT we have great intellects and Club men who are able to help in leadership roles and fill the gaps that I can’t fill. 5. How has the Club changed since you first ran on in the white a blue all those years ago? It has certainly changed in terms of professionalism; yet, the people haven’t changed in terms of culture and club values. I think the Club’s Executive Committee have been key here, and with Johnny Biderman-Pam at the helm I think we will grow from strength to strength. Sometimes when I think about the days in the old cage with the old guard, Fish, Door, Footie, Crusty I get quite nostalgic, but as I said the club is moving in the right direction and long may it last. 6. Who is the most talented Ikey you have ever shared the field with? Why? I am probably biased here, but it has to be Marcel Brache. The guy is a freak of nature. He is probably one of the most genuine human beings around, and then just a natural on the rugby field. We all know his story, but he makes it look easy. We grew up together and from that age I knew he would go on to great things. I am super proud of him and his achievements, and it was an honour to play with him. But again, there have been so many players, others would have to be Zandy Macdonald and Richard Stewart – similar to Marcel in that they are sporting freaks. 7. 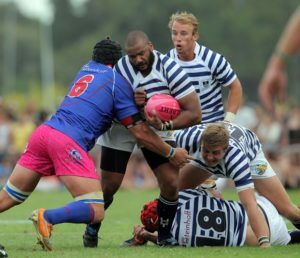 How would you describe the spirit of the Ikey Tigers? It’s a spirit that never dies, no matter what the results are the Club will always thrive. We play for each other here, so many other Clubs see money being the main thing for players, but here it’s about more than that. It’s about the man next to you. We never forget the stories, we relive the memories over and over and we always come back to the things we know, the Ikeys. 8. Over your time at the Club, which Ikey would you say best embodied that Ikey spirit? Why? For me there are two people, the first some might not know, but it would be my u20 Captain Monte Taaljard. He was taken from us far too soon. For me he epitomised the Ikey man and spirit. To him the Club always came first, and I have no doubt he would have captained us for many years and lead the Club forward. The second would have to be Peter Haw, not the biggest player in the world, but definitely one of the biggest hearts. 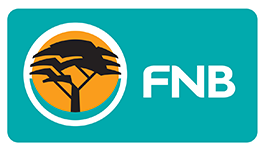 If you have some free time go and watch the last 10mins of the Varsity Cup final. The smallest player on the field in the pink shorts puts his body on the line for his brothers with no regard for himself – that for me is the Ikey Spirit. 9. Congratulations on being appointed Head Coach of the Under 20A side for 2019, coming full circle and giving back to the Club. If you could give yourself one piece of advice now ahead of your 1st Ikeys cap at under 20 level all those years ago, what would it be? * = Still playing for the Ikeys. Accurate as at 8.9.18.